Episode #59: Yanis Varoufakis On today’s show I travel all the way to the beautiful island of Greece to speak with finance minister Yanis Varoufakis. Yanis sets us straight about the history of economics and about how some of the old models we hold onto need to be left behind as we open our minds to new paradigms and new freedoms for all people. Magic Word Hidden in each episode of Bitcoins and Gravy is a Magic Word. I know that it may sound absurd, but listen for the Magic Word and you can earn LTBcoin! First set up a free account at LetsTalkBitcoin.com. Then tune in to your favorite LTB podcast and when you hear the Magic Word, don’t delay! Submit it to your account and by doing so you will earn a portion of the week’s LTBcoin distribution. Setting up an LTB account has always been fast and easy . . . and now it’s profitable!!! Great news listeners! Our transcription page is now live on the website thanks to the continuing hard work of one of our loyal listeners who I am proud to say is now also a consultant to the show. All new show transcripts will be rolled out Approximately one week following the release of each podcast. We are also working on eventually going back and transcribing ALL of the archived episodes starting with Episode #51 and working our way back until we hit the very first episode, Episode #1, Numero Uno of Bitcoins and Gravy! 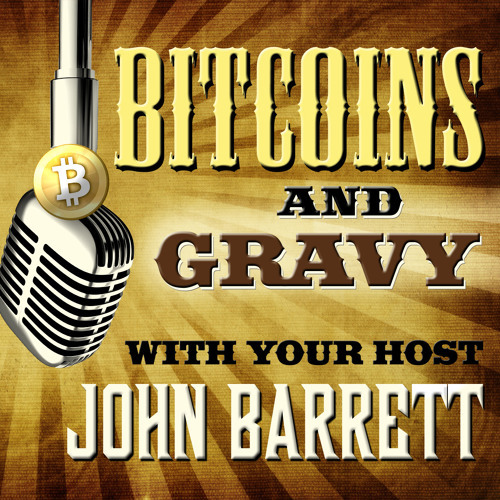 Our ultimate goal is have every single episode of Bitcoins and Gravy transcribed and available to you the listener for free. These Professional transcriptions are provided each week by one of our fans who can be found at: http://diaryofafreelancetranscriptionist.com/2015/01/21/free-transcript-project-8/ And of course you can find a link to this website in the weekly show notes. CREDITS: Yanis Varoufakis Zorba The Greek Sean’s Outpost Bitgive Foundation Capital Area Food Bank Without Regrets Texas Bitcoin Conference Ode To Satoshi Ode to Satoshi lyrics & melody by John Barrett Copyright 2014 RJM Publishing - BMI Nashville. Lead Vocal, Harmony Vocals, Harmonica, Snare Drum: John Barrett Harmony vocals: John Barrett, Connie Sinclair and Lij Shaw Guitar: Jonathan Brown Mandolin: Ben Miller Bass Guitar: Michael Rinne Initial tracks recorded by Mark Thornton of Sidekick Sound Studios, Madison, TN. All other tracks Recorded, Mixed and Mastered at The Toy Box Studio, Nashville, Tennessee Engineer: Lij Shaw. Assistant to engineer: Don “The Don” Bates Produced by John Barrett & Elijah “Lij” Shaw Special thanks to Alan Baird for his dobro, guitar and mandolin playing on many of the shows. Now that’s some pickin man! Thanks also to Alex Munoz Guijarro for his excellent pedal steel playing on many of our shows. Interviews for this episode were recorded and edited by John Barrett at The Tree House Studio - Nashville, Tennessee. All shows are produced by John Barrett with the moral support of his trusty sidekick Maxwell Rascalnikov CoyoTe Rex, aka Max. Theme song “Gravy” by the band, Eleanor Roosevelt with Elijah “Lij” Shaw on fiddle. And a big thank you for moral support from my good friends at The Tennessee Bitcoin Alliance: TennesseeBitcoin.org Questions or Comments? Email me to say Howdy! : howdy@bitcoinsandgravy.com Visit theWebsite: BitcoinsAndGravy.com Bitcoins and Gravy Tipping Addresses: Bitcoin: 1ByqQXLTm9JZGSwnfqCCakaifBt3grQkXS Litecoin: LgqYgxLTBPgr8C1JGLLJVLK4ZN1fveprAp And if you don’t feel like contacting me, just kick back, relax and enjoy the show. I hope you enjoy listening to my guests as much as I enjoy talking with them!